my favourite xmas-type story | Kris + Books = Good. *Sometimes*. Terry Pratchett is one of my favourite authors of all time. The extent to which I adore his work is proven by the fact that I never wait for the paperback editions of his books (I’m patience personified for all other authors I read/keep). I always, always buy him in hard cover; cost is not an issue for me when it comes to the great TP. Welcome to the Discworld. It started out as a parody of all the fantasy that was around in the big boom of the early ’80s, then turned into a satire on just about everything, and even I don’t know what it is now. I do know that in that time there’s been at least four people promoted as “new Terry Pratchetts” so for all I know I may not even still be me. 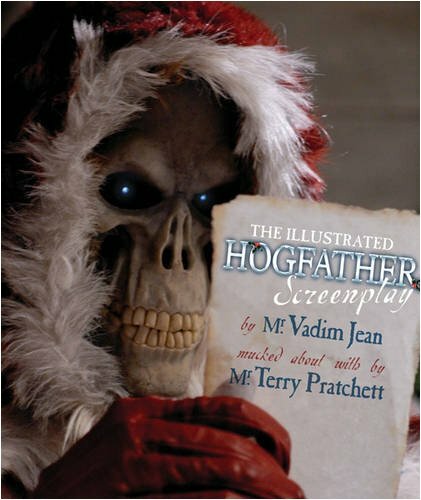 You may have already guessed my most-loved Christmas-type story is one written by TP entitled Hogfather. Susan the governess has got to find him before morning, otherwise the sun won’t rise. And unfortunately her only helpers are a raven with an eyeball fixation, the Death of Rats and an oh god of hangovers. 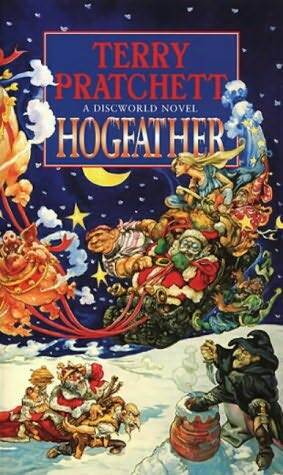 TP is an extraordinarily clever writer and this book is a very enjoyable parody of Santa Claus and other tales. It was adapted to television in 2006, but I’ve yet to see it so don’t know if it was good or bad… hee, hee… get it?? Well, I thought it was funny. Death as Santa… you gotta love the imagination of someone who comes up with that. This entry was posted in book pimpage, fantasy, Terry Pratchett. Bookmark the permalink.